Note 1: Like soccer games? Check out my reviews of Nekketsu High School Soccer and Nekketsu Soccer Hen! Note 2: This game was played on an NES 101 model (toploader) that was modified to output in AV composite (red, yellow, white) just like the original NES. It was connected to a 32-inch HD tv. 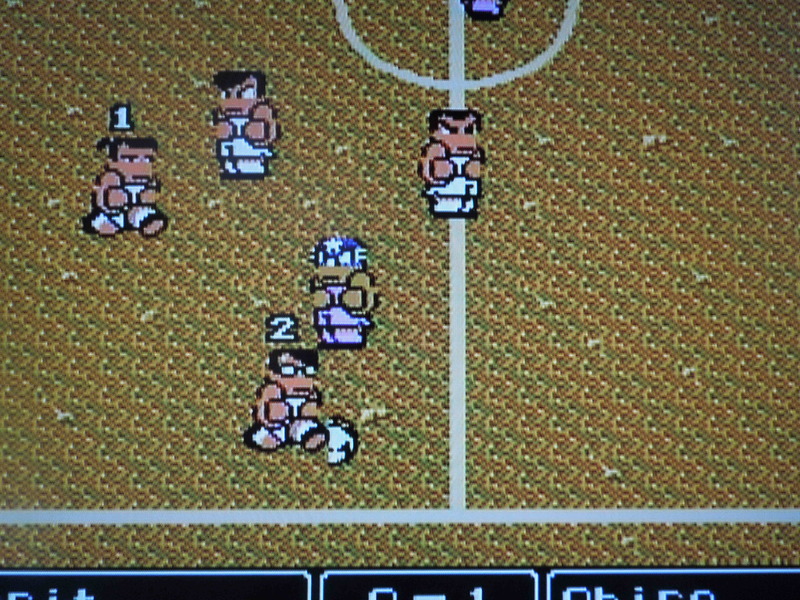 Quick History: Kunio-kun no Nekketsu Soccer League, released only in Japan for the Famicom in 1993, is the sequel to Nekketsu Koko Dodgeball Bu: Soccer Hen. 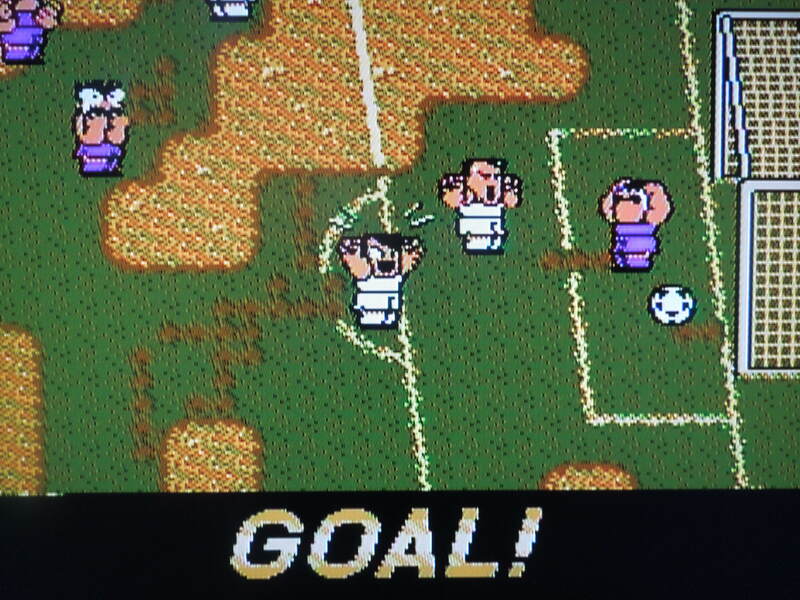 Soccer Hen was released for the Famicom, PC Engine (see my review), Mega Drive (see my review), and NES (the game was renamed Nintendo World Cup and some things were changed). 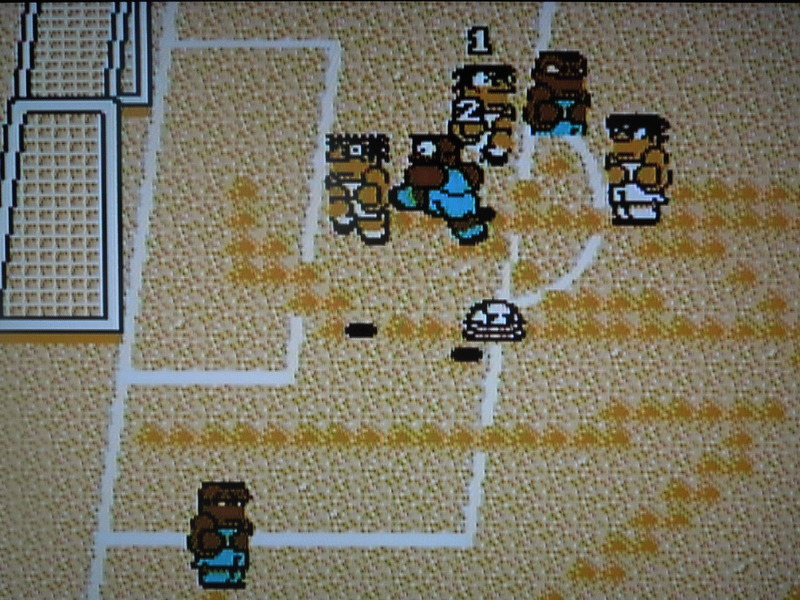 Nekketsu Soccer League, unlike Soccer Hen, was not released on multiple systems – only the Famicom (Japanese NES). 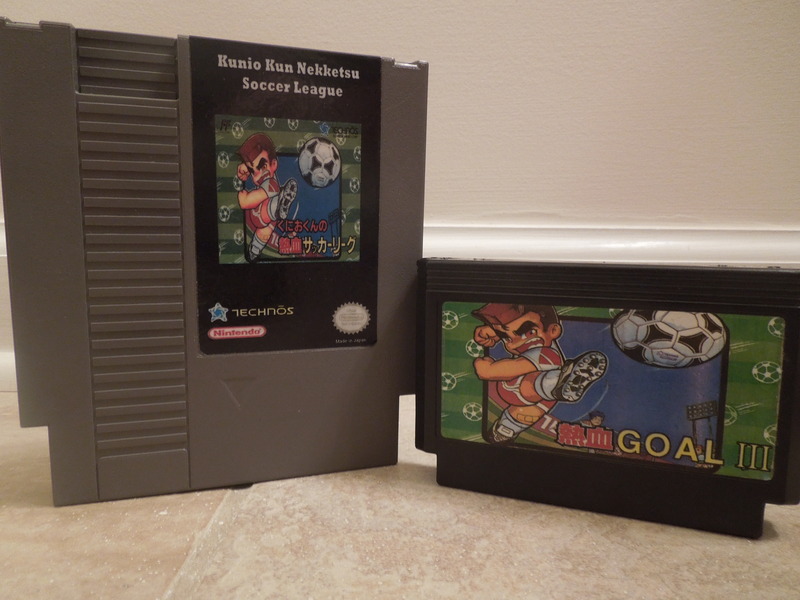 There was a Famicom bootleg copy of Nekketsu Soccer League known as Goal III released as well, although it still contains the Japanese language. Several years ago, Nekketsu Soccer League was translated by fans, and today, it can be placed on cartridges for play on the original NES console. This review is for the NES reproduction/translation cartridge of Nekketsu Soccer League. Story: Kunio and his soccer team are encouraged by Misako (their female manager) to participate in the Technos World Cup. In order to do so, they must first travel to multiple international locales and beat other teams to qualify for the Technos World Cup Tournament. Control: You only ‘control’ one player on your team, but you can ‘tell’ your teammates what to do. A passes (or tells your teammate to pass). B shoots (or tells your teammate to shoot). A+B jumps with the ball. Pressing B in the air executes a Super Shot. On defense, A slide tackles (or tells your teammates to slide tackle). B shoulder tackles (or tells your teammates to slide tackle). Additionally, you can jump on top of your teammates shoulders, or even on top of the ball. Modes: 3 modes are available in Nekketsu Soccer League: Nekketsu League (Season), Match (VS), and Penalty. -Season (Nekketsu League): For 1 player or 2 player co-op. In 2 player co-op, player 1 is a mid-fielder, and player 2 is the goalie. Both players can run all over the field at any time, however. As Nekketsu (Japan), you choose among 12 opponents to face. You must win approximately 25 matches (earn 70 ‘points’ – more on this in a bit) before qualifying for the Technos World Cup Tournament, so obvisously you can choose to play teams more than once. A password system saves your progress throughout the Season – you get an updated password after each match. – Match: For 2 players only. Each player selects from 6 teams and compete in a match. The 6 available teams are Nekketsu (Japan), Italy, Germany, Argentina, Brazil, and Cameroon. All of the teams have their own unique 6 players, with their own speed/power/defensive stats, as well as their own unique Super Shots. Players can select to be the same team. *Note: This mode has an option for 3 or 4 players, but that mode, unfortunately, will not work on an NES console, even with a multi-tap. 3 or 4 player mode would only work on an actual Japanese Famicom with the proper peripherals. -PK: For 1 player or 2 players: Select from among 6 teams and compete in a ‘best of 5’ PK battle. Each team will have 5 penalty kick opportunities, and the teams alternate. You control the kicker on offense, and the goalie on defense. Each PK attempt has a time limit of 7 seconds. If the score is tied after all 5 kickers for each team have kicked, additional kick opportunities will be available until there’s a winner. More About Nekketsu League (Season Mode): There are 12 teams you can choose to play against in Season Mode. Depending on who you beat, you earn ‘points’ for the win. You cannot play and beat any 1 team more than 3 times. 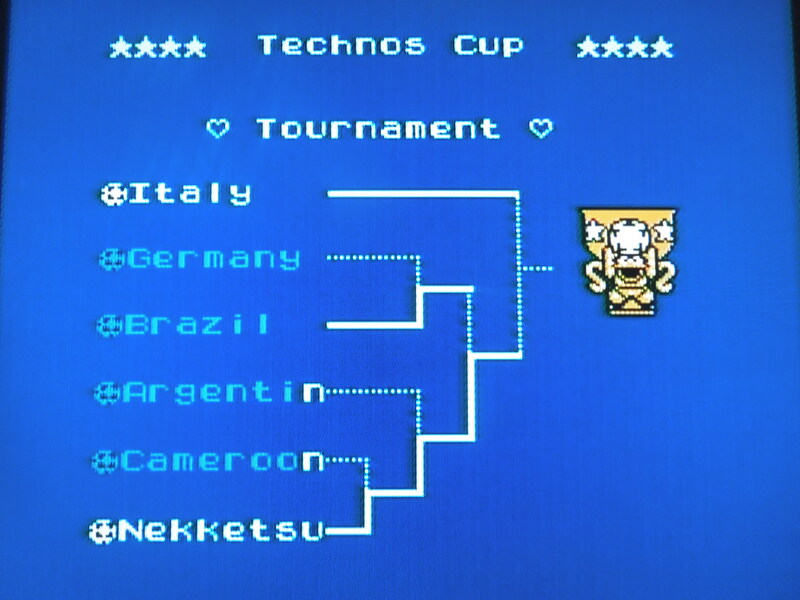 You need 70 points before you can enter the Technos World Cup Tournament. You get an updated password after each win, and this password keeps track of your wins and points. After beating the Season Mode, you’ll qualify for the Technos Cup Tournament. Technos World Cup Tournament: Once you have at least 70 points, you can choose to participate in the Tournament if you choose. The Tournament is for 6 teams, but you are seeded # 6, and must actually play 4 matches. If you lose even one game, it’s Game Over, as you do not receive a password between matches in the Tournament like you do in regular-Season mode. The Tournament teams can be tough, so hopefully all the practice during your Season got you ready. You do get a ‘Runner-Up’ trophy and ending if you reach the Title Game and lose, at least. Gameplay: During the Season and Tournament, you can only play as Japan. The games are 6 on 6 soccer. Each game is divided into 2 minute halves. If the game is tied at the end, the game will go to a Penalty Kick Shootout to determine a winner. Before each match and at half time, you can change up the on-field formation of your team, select your 6 starters from your team’s 12 players, and give directions to your computer-controlled teammates (like ‘Always Shoot/Always Pass). You can also have a ‘meeting’ (optional) with your teammates where you can talk to them or give them items that may boost or drain their statistics. Before games, you can change up player positions and formations. Players: Kunio, Yoritsune, Saji, Horibata, Iwakabe, Genei, Ugajin, Onitake, Kumon, Kaizuki, Tsunewo, and Carlos make up your Nekketsu Japan team. Before each match, you can select who you want your starters to be, as well as which player you will control. All 12 players perform differently. Some are slower and stronger, some are quicker and weaker, and some are balanced (you can view their stats in the ‘meeting’ option). Each has their own Super Shot. When you’re selecting who to put in what position, if a player is ‘smiling,’ it means he’s fit for that position; if a player is frowning, it means he’s not a good choice for that position. 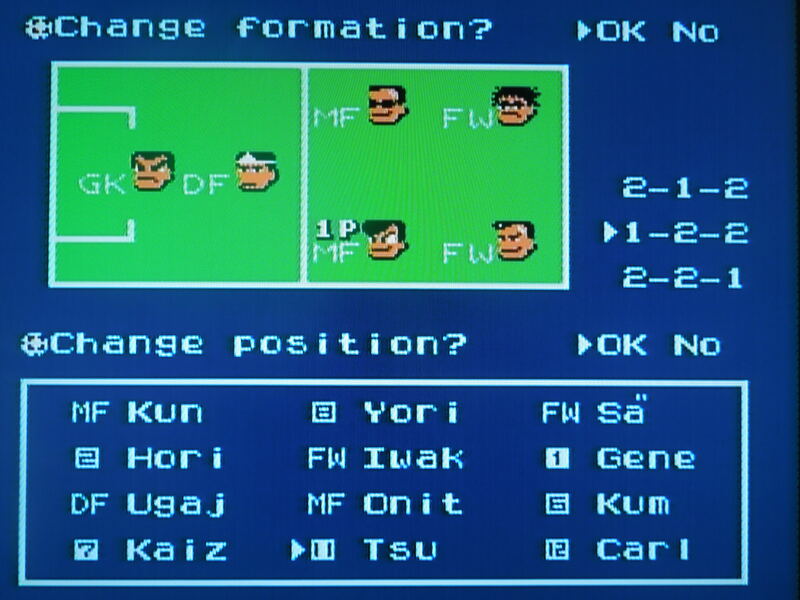 Note: In 2 player VS mode, the Nekketsu team only has Kunio, Yoritsune, Saji, Horibata, Iwakabe, and Genei available. Fields and Weather: Depending on which team you’re playing, you’ll play on grass fields, sand fields, or even in the mud. Wind, rain, tornandos, and even lightning can occur during matches, and all of these can have an effect on the outcome of the game. Weather and field conditions can impact the outcome of matches. Music & Sound: Great. Before each match, you can choose from among 7 different themes to play during matches. They range from fun, easy going tunes to intense, ‘final match’ themes. Sound effects are well done as well. Roughing up opposing players and executing Super Shots have notable effects. So, where can I find this game? You can find the original Famicom cartridge on eBay, but you’ll need a Famicom console or a ‘Famicom to NES’ converter to play on an NES. Many online sites now offer the translated version on an NES cartridge. You can play the rom on a computer emulator. Conclusion: Nekketsu Soccer League is a terrific soccer game. It offers more variety than its predecessor, Soccer Hen, with the best addition being the PK Overtime. The weather affecting the game is a nice touch, but it does cause some slow-down, and this game plays a bit slower than Soccer Hen. The controls are very easy to learn, and having 3 levels of difficulty to choose among is a welcome addition. It would have been great if you could select any of the game’s 12 teams to play through the season mode with instead of just the Japan team, and it’s unfortunate that even in 2 player VS, you can still only select 6 of the 12 teams. The two-player co-op is fun, but having Player 2 unchangeably relegated to the Goalie position was a mistake – fortunately, Player 2 can still run all over the field and isn’t stuck waiting for the action (like in Nekketsu Ice Challenge – see my review). This game has much replay value due to its Season setup (and the fact that it’s really fun), and winning the Technos World Cup will take some skill. 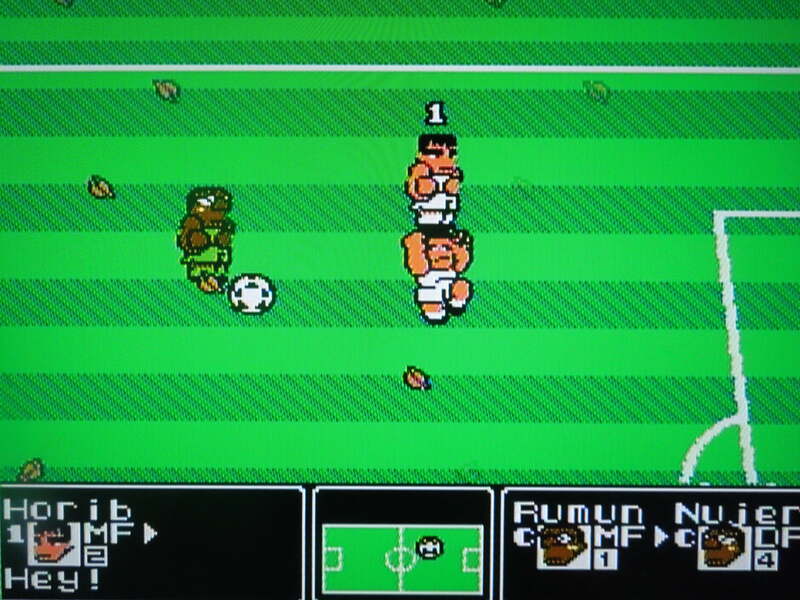 Arguably the best soccer game on the NES.